Clonmacnoise was founded in 550 AD by Saint Ciaran who erected a small wooden church here as well as some wattle huts with a very small community. 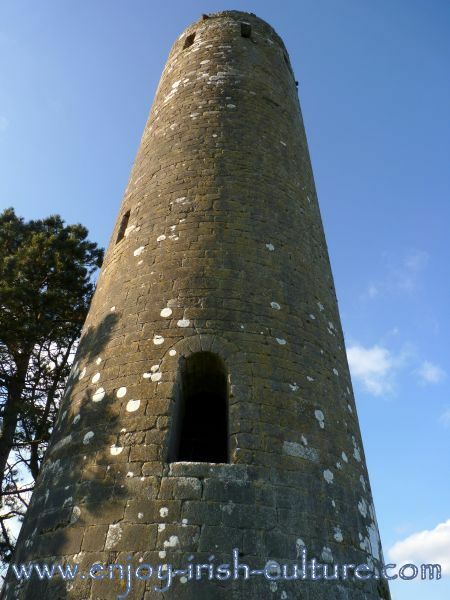 Because of its auspicious location at the crossroads of two major medieval traffic routes, this Irish monastery became bigger and more important than any other at the time. By the mid 8th century the site had expanded into a thriving centre of learning and art. This Irish monastery wasn’t just any old monastery. It featured up to 17 churches. The walls of 10 of those are still intact. The monastic site had a 10 acre settlement area attached to it which housed not only monks, but also lay people. There were traders and crafts people such as metal workers and stone carvers. There were people with all the skills necessary to run a medieval town. In fact, at the time, this place boasted Irelands’ largest settlement outside Dublin, such was its’ importance. A huge farming area was associated with the monastery which may have stretched as far as 15 kilometres either side of the river Shannon. Remains of a very old High cross show beautiful detailed carvings. By the 9th century a bridge was built across the river Shannon made of heavy timbers. The bridge was 120m long and 4m wide. This was Ireland's oldest significant bridge. (A model of it can be seen at the visitors centre.) On the other side of the river, the settlement continued. Archaeologists have found evidence of a medieval hostelry there indicating that Clonmacnoise drew many pilgrims. 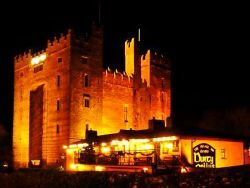 McCarthy's Tower and the view onto the river Shannon. Stunning. The monastery was given lands by the O’Conor kings of Connacht who were buried here after they converted to Christianity. (The ancient kings of Connacht were buried at Rathcroghan.) 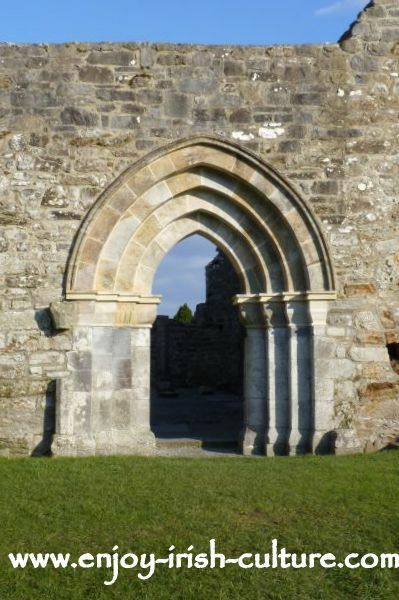 This patronage cemented the important role the monastery was to play in early Christian Ireland. Rory O’Connor, the last High King of Ireland was buried at the altar of the Cathedral here in 1198. Today, ten churches are structurally intact apart from their roofs. The largest building is the Cathedral which was built in 909 by Abbot Coleman and King Flann. 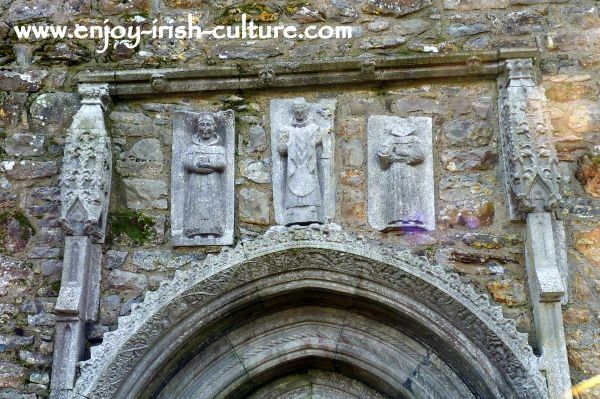 There is a beautiful 15th century doorway facing North featuring decorative Gothic carving depicting Saint Dominic, Saint Patrick and Saint Francis. Clonmacnoise became a centre for teaching and education and drew scholars from as far afield as Britain and continental Europe. It was a major centre for the production of manuscripts. The 11th century annals of Tigernach (annals are history records written by monks), and the 12th century Lebor Na hUidre (Book of the Dun Cow) were produced at the Clonmacnoise scriptorium. The Book of the Dun Cow is the oldest surviving manuscript written entirely in the Irish language. A large part of the book is devoted to the Táin which is the central tale of the so-called Ulster cycle, an ancient epic, product of a native pagan oral tradition, finally recorded here by the monks at the scriptorium. 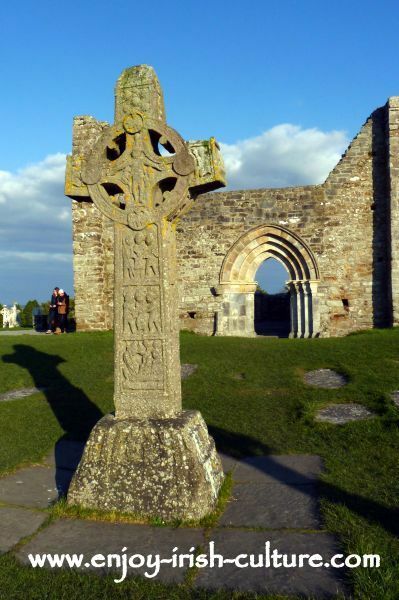 There were important stone carving workshops at Clonmacnoise which produced High Crosses as well as grave slabs. There were metalworking workshops, too, which produced some beautiful treasures that can be seen at the National Museum, such as the crosier of the Abbots. 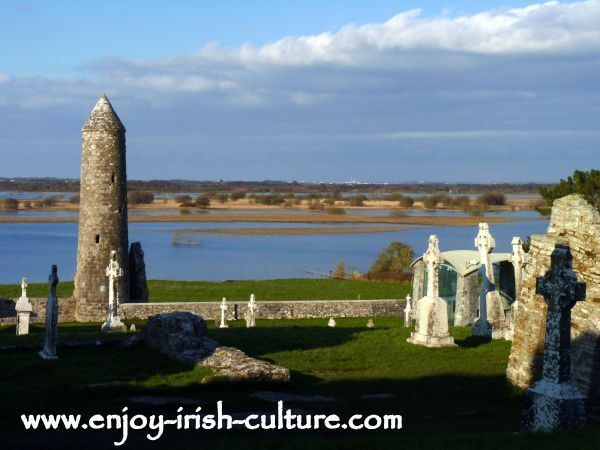 Read here about the beginnings of Clonmacnoise, and find out tourist information here on how to get there, a review and read our special tips. Many treasures were taken though during the numerous times that Clonmacnoise was attacked and raided. In its’ 1,400 years of being an important monastic centre, the monastery was attacked 8 times by the Vikings, 27 times by other forces such as Irish kings, the Normans and by other monasteries. The monks rebuilt the settlement after each attack. 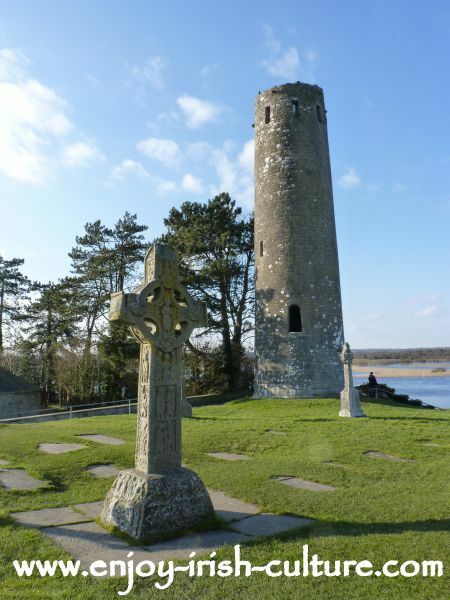 However, rebuilding was not an option when Clonmacnoise was finally destroyed by English soldiers in 1552. This action was part of the dissolution of monasteries under the reign of Henry VIII. The English soldiers are said to have taken absolutely everything they could possibly move, and to have destroyed the rest. In fact, it is a miracle there is anything left behind. Wondering what round towers were all about? Find out by clicking the link. The museum at the visitor centre features three high crosses which are now kept inside to protect them from the elements. The crosses seen outside are replicas. The most notable of the crosses is the Cross of the Scriptures seen below as a replica (the real crosses are now indoors for protection) which shows the crucifixion, Christ in the tomb, and the last Judgement. The cross is 4m tall and carved from a solid piece of sandstone. It is very similar in content and finish to another High Cross at Monasterboice. Peter Harbison who has studied these crosses in great detail has proposed that both crosses are similar in age, might have originated in the same workshop, and might be much than originally thought, dating them to the 9th century. The other two crosses feature a simpler design. The South cross features the crucifixion surrounded by Celtic knot work. The North Cross is carved with Celtic ornaments, some humans and animals. All three are beautiful, and they alone are worth the visit. If you enjoyed this article about Ireland's best early Christian monastery, and if you like what we do on Enjoy Irish Culture- please pay it back! We'd appreciate if you used the social buttons provided at the top left and bottom of page to give us a shout out!